Nigeria’s Service Chiefs on Thursday re‎vealed that the failure of the Federal Government to release the 2015 supplementary budget is hampering their ability in the fight against Boko Haram in the North East. This was contained in a statement issued by the office of the President of the Senate, Dr. Abubakar Bukola Saraki, which was made available to our correspondent on Thursday. 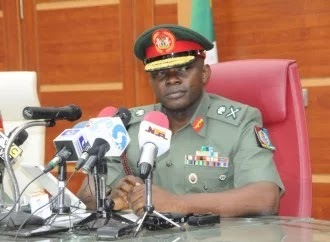 According to the statement, the military chiefs, led by General Abayomi Olonishakin, the Chief of Defence Staff, briefed the senators on the various challenges faced in the fight against Boko Haram, particularly the state of their equipment, which they said requires serious upgrading and restocking. They also complained that their vote in the 2015 supplementary budget had not been released, thereby hampering their ability to fund their operations. ‎At the closed-door meeting, which lasted for about two hours and presided over by Saraki, several issues tailored at further empowering the security agencies to win the war against the Boko Haram insurgency were discussed in a frank and open exchange between the two sides. Other issues that came up for discussion was the need to continuously increase the personnel in the three arms of the military and the hindrance posed by the procurement process, which they said is very slow. The military chiefs also canvassed the need for the review of some laws governing their operations so as to make them able to respond to emergency situations they now confront in the North East zones as well as conform with global best practices. The need for regional support for the fight against insurgency in the North East by the neighbouring countries, resettlement of Internally Displaced Persons in their traditional homes, the issue of intelligence gathering and sharing among the various agencies and mobilisation of the international community, particularly through inter-parliamentary efforts in support of the fight against terrorism in Nigeria, were also discussed. The senators assured the military chiefs that they will fast track the request for the review of the relevant laws being complained about by putting them on the Priority Bills list once they were given adequate information on areas that needed to be amended. They also promised to take up the issue of release of funds raised by the military chiefs with the Ministry of Finance immediately. The committees on Defence, Finance and Appropriations have also been mandated to ensure that the issues raised by the Service Chiefs are taken care of in the budget. The senators noted that at this point when the nation had recorded serious gains in the fight against insurgency, all hands should be on deck to sustain the tempo against the violent groups. The meeting was attended by Saraki; his deputy, Senator Ike Ekweremadu; the Senate Leader, Ali Ndume; the Deputy Majority Whip, Francis Alimikhena; the Chairman of the Senate Committee on Navy, Isa Hamma Misau; and his colleague in the Committee on Air Force, Duro Faseyi. However, Chairman of Senate Committee on Defence, Senator Ahmed Lawan, was absent. Olonishakin led the Chief of Army Staff, Lieutenant General Tukur Buratai; his colleague in the Navy, Vice Admiral Ibok-Ette Ibas; and the Air Force, Air Marshal Sadiq Abubakar, to the meeting. 17 Year Old Boy Becomes King in Nigeria. Gunmen kidnap Goodluck Jonathan’s uncle, Again! !